Your customers look to you for innovative ideas and the latest and greatest technology to help them meet their sustainability goals in building design and for on-going operations. 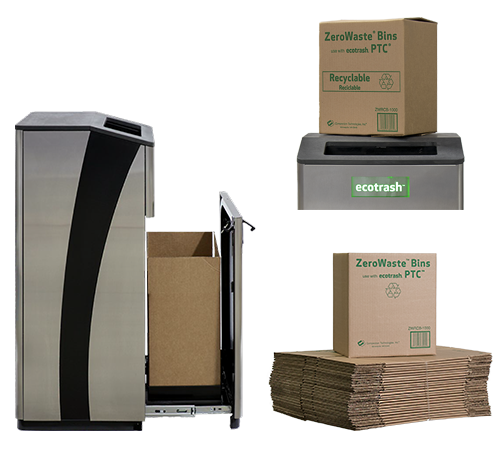 Compaction Technologies, Inc. (CTI), makers of Original ecotrash®, ecotrash PTC®, and ZeroWaste® Bins, has products and services that enable your customers to document their waste diversion performance and reach their sustainability goals. Say goodbye to over-flowing trashcans and paper towels on the restroom floor. Staying on top of cleanliness in restrooms can be a challenge. Air-dryers are ineffective at drying hands and consume too much electricity to be considered sustainable and cost-effective. Paper towels are preferred by consumers but are hard to efficiently dispose of, almost impossible to store, and can’t be recycled when they’re captured in plastic bags. CTI technology is changing that. 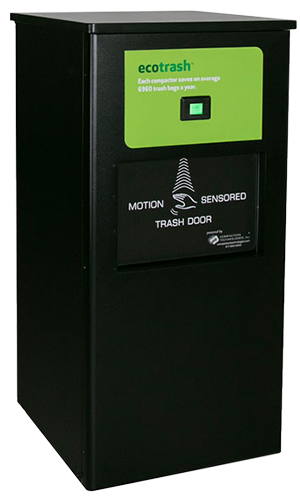 CTI is transforming restroom trash handling with ecotrash PTC. 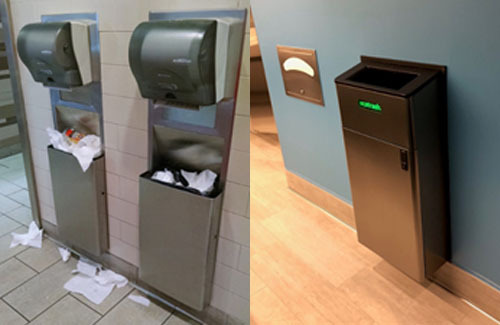 Instead of dispenser/trash can units overflowing after just a few deposits, ecotrash PTC holds 1,000 paper towel deposits; keeping restrooms clean while reducing waste removal frequency by 95 percent, compared to a 6-gallon Bobrick built-in trash-can. Restrooms equipped with ecotrash PTC are clean, litter-free, and present tenants and their customers with unmatched cleanliness and efficiency. Recycle Paper Towels with ecotrash PTC and ZeroWaste Bins. If your client’s goal is to recycle paper towels, install ecotrash PTC, then replace the bin and plastic bag and insert a ZeroWaste Bin. These 100 percent recyclable, 100 percent compostable boxes are precisely sized to replace the trash bin inside an ecotrash PTC. When they’re full, simply fold-shut the top flaps and deposit the entire box into a cardboard recycler. No changing liners. No pulling and handling fluffy bags of paper towels. Just a single-use box that folds shut and you’re done. You’ll fit 1,000 paper towels into a 5 ½ gallon box (13” h x 11.5” w x 8.5” d), that is perfect for palletizing, efficient storage, and cost-effective transportation. For the first time, easy paper towel recycling is a reality. For maximizing the floor space in restrooms, ecotrash PTC can be built into the wall. Our in-wall kits provide the housing for simple installation by your building contractor. Maximize floor space with Original ecotrash. When designing high volume dining areas, waiting rooms or break rooms, waste collection containers are a necessary evil. They’re needed to hold trash, recycling, and even organics, but take-up valuable floor space, which could be used for guest seating, wider aisles, or other purposes. Multiple waste containers also mean multiple pick-up points for employees to manage for the life of the building. With CTI’s Original ecotrash and ecotrash PTC, architects and designers can rethink waste containers during the design phase and improve the floor space and functionality of the entire building. Original ecotrash compactors hold five times more trash than traditional trashcans, which means 80 percent fewer trash cans are needed; more floor space is available for wider, uncongested foot traffic; more space for seating; and 80 percent fewer trash collections for the life of the building. Want to design Original ecotrash into your next project? We can help!